Agreeing to determine the discretionary power of the state to do so, the bench, however, refused to stay the operation of the Government Order in the interim. While on behalf of the petitioners it was contended that to give public money for a religious activity was a violation of the constitutional principles, Senior Counsel Kapil Sibal, for the state, argued that the money is being given by cheque to societies registered in the state towards the ends of safety. The petitioners further pressed that there are no guidelines in this behalf and how the money is to be tendered and expended. It was urged that a stay be granted lest the petition be rendered infructuous on account of the festival of Durga Puja being next week. The grievance of the petitioners arises from the state Government’s decision to extend grant to 2,8000 Puja Organisers apart from the benefits of waiver of fee for fire safety certificate and other license fee. It is their further contention that the above grant has been announced without any formal Notification in the name of the Governor of West Bengal, as appeared in a news report dated September 11, 2018 published in a daily newspaper "Indian Express". According to the above report, a sum of Rs. 10,000 has been announced to be accorded to 3000 Durga Committees in Kolkata and 25000 Puja Committees across the state of West Bengal. It was claimed by the petitioner that no public purpose will be served by granting money and handing out concession to the Durga Puja Organisers and for that reason, the above decision of the State Government is violative of the provisions of the Article 282. Further, if the State funds, which consist of payment of various taxes by bona fide citizens, are utilised for a religious purpose, it offends the spirit of secularism and the object of Article 27. Extending financial help for organising Durga Pujas amounts to patronising and favouring a particular religion over all others by the state Government, thereby violating the provisions of Articles 14 and 15, contended the petitioner. “Once it is shown to the Court that there is a provision in the Budget and in the Appropriation Account, it is the settled principle of law that it is permissible for the Government to spend such money, which had not been specifically provided at the time of allotment in the Budget. After the expenditure is incurred, in the subsequent year, it will be included in the account and then it is for the legislature to decide upon the propriety of the expenditure or otherwise. The Comptroller and Auditor General has a major role to play in auditing the Government account in this regard. According to the aforesaid settled principles of law, it is not permissible for the Court to interfere in that event at the first instance”, observed the bench of Calcutta HC. 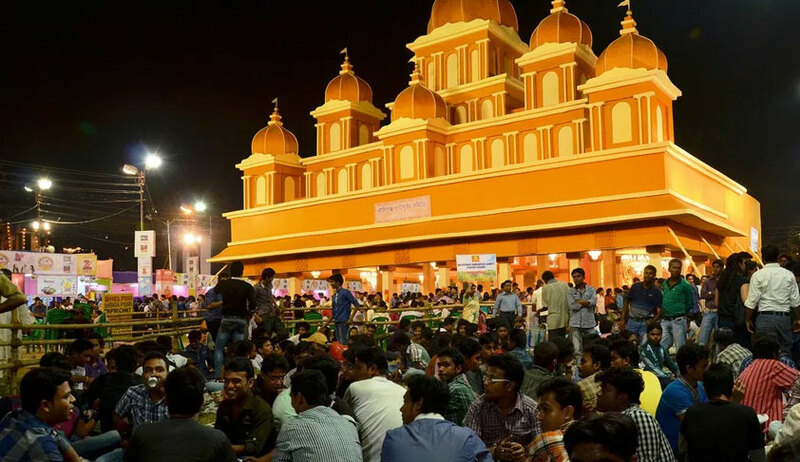 “In arriving at a conclusion, we cannot ignore that a substantial quantum of money has already been released in favour of the various Clubs and Puja organisers. However, we make it clear that while we arrive at a considered view that the legislature is the appropriate forum to decide upon the propriety of the aforesaid nature of expenditure at the first instance, it is open for the Court to interfere with the propriety of the action on the part of the Government at a later/appropriate stage, if the occasion so arises”, stated the High Court in its impugned order of October 10, not inclined to entertain the petition at this stage.